★★★★★ I use this with my edit system where I cut HD and 4K. The images are beautiful and sharp. The large size screen allows me to have multiple windows open while working, and without feeling crowded. Love this monitor. ★★★★★ This is the monitor that should have bought a few months ago. I was looking for a space saver on my desk. This monitor is beautiful and the speakers sound great. 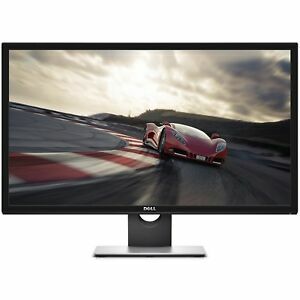 Manage to buy this monitor at a good price. This was a great buy. ★★★★★ This thing was life new. The picture is amazing, and I couldn't be happier. I was surprised that it didn't have a Vesa mount but other than that it's amazing! ★★★★★ The resolution is great all in all it’s a great value. The color is not quite what I would like but it’s on par with what I would expect for such an inexpensive monitor. ★★★★☆ Dell products have been good to me. The picture is sharp but the color is a little dull.